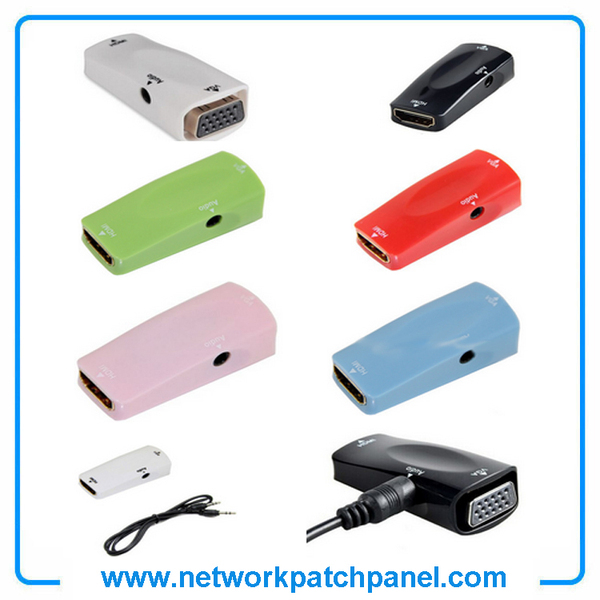 China hdmi to vga manufacturers,suppliers and factory. This HDMI Female to VGA adapter with 3.5 audio cable be applied to HDMI video devices, such as Desktop/laptop/mobile phone/DVD/tablet/digital set- top box/player/digital camera/SLR camera/video camera equipment withHDMI output signal source. 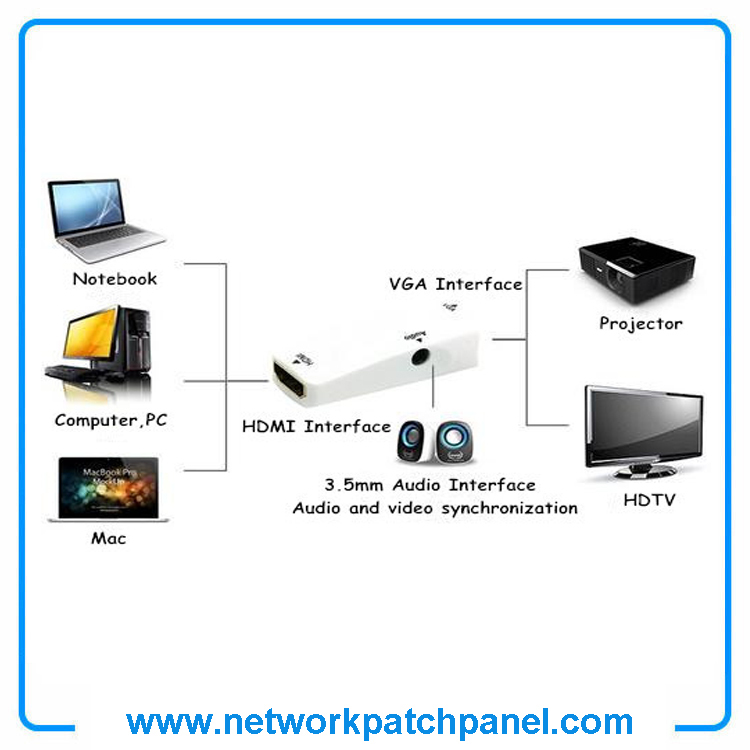 With this converter, HDMI signal of above mentioned device can be displayed on VGA display device, such as TV, monitor, projector display, ect.. It also convert voice signal and output to 3.5 mm audio jack for connection with speaker or earphone audio devices. 2.High Resolution, Low Power Consumption Fashion Design. 3.Small in size, low power consumtion,only need 5V less than 140mA. 4.No need for external power. Power supply from HDMI port. 5.Energy Star. Low-power standby when VGA is not connected. 6.With built-in chipset, it supports full-size active high-definition display, resolution up to 1920x1080. top box/player/digital camera/SLR camera etc) and VGA ONLY display device(monitor, projectors, etc). 8.3.5mm audio output to connect to external audio devices, like external amplifier or speakers. with 3.5mm Audio Cable USB Power Cable is with below advantages. HDMI to VGA Adapter with Audio is widely used for HDMI input source desktop / notebook / phone / DVD / Tablet PC / digital set-top box / player / digital camera / SLR camera / video camera and other equipment through this adapter connected, so that the TV / monitor / output projectors and other display devices.It is ideal to solve the user display device connectivity solutions. 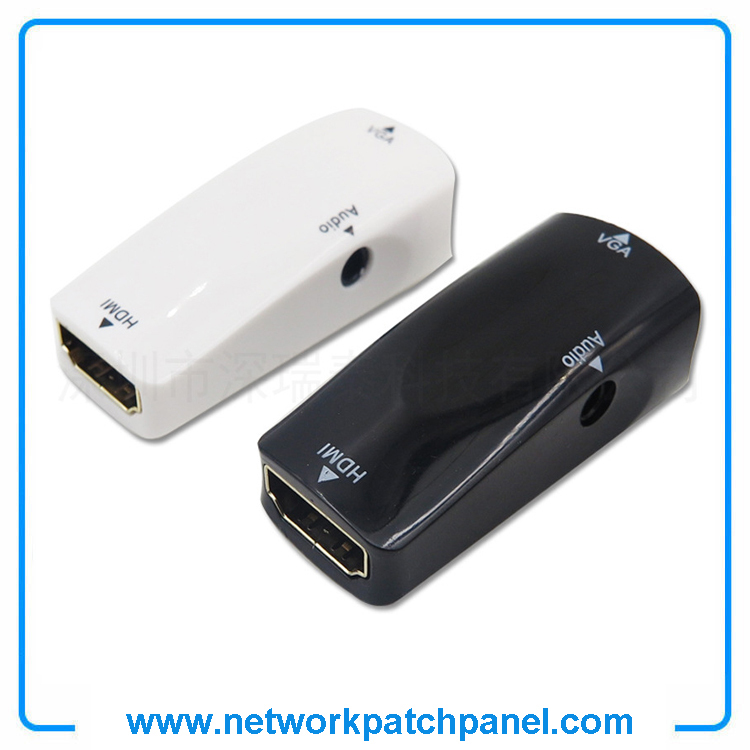 Compact/ HDMI Female to VGA Female and 3.5mm audio output adapter. 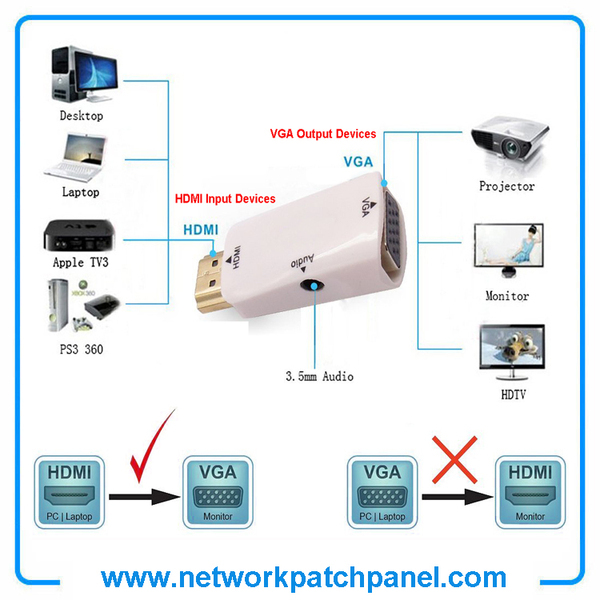 How to Use HDMI to VGA Adapter? Simply connect the HDMI male end of the adapter into an HDMI connector of notebook or desktop PC and the female end of the adapter to your VGA cable from the display. It converts HDMI digital signal to VGA analog signal and supports full-size high-definition resolution of 720p or 1080p. A perfect companion for an easy and enjoying life. 1. This HDMI Female to VGA adapter is unidirectional,canot not convert VGA to HDMI. 2. This is the regular HDMI adapter, would not fit for micro HDMI and mini HDMI connector.